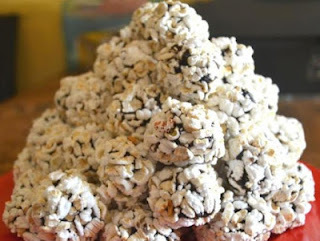 Borondong is a typical Sundanese traditional food, made from glutinous rice or corn which is used as pop corn first. Once the pop corn is cleaned first its shell, then mixed with red sugar or sugarcane kinca formed round or square. There are two types of borondong namely borondong crisp (dried borondong) and borondong enten. Borondong crisp is made by mixing the kinca with corn / glutinous rice sangan and formed. Borondong enten is made by making first enten from glutinous rice. Enten is a kind of diamond, glutinous rice which is processed with sugar so that it is solid. Enten glutinous rice shaped round and then covered with maize. To add the aroma to borondong, added perfume from pineapple or mangoes type kweni. Borondong is served with warm tea as a snack. Basreng (short for baso goreng) is a Sundanese snack made from processed fish meatballs that are thinly sliced and then fried. Basreng can also be served with spicy spices. Basreng sellers currently serve basreng with varying levels of spiciness. In addition to the spicy variant, there are also other flavours depending on the spices used perisa, among others cheese, seaweed and others. 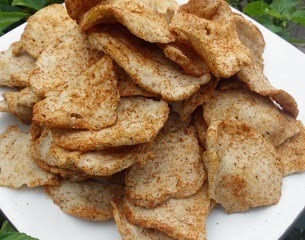 In addition to flavour variations, basreng can also be fried dry or undercooked. If fried dry, will feel crunchy like crackers and if half cooked will feel chewy if chewed. 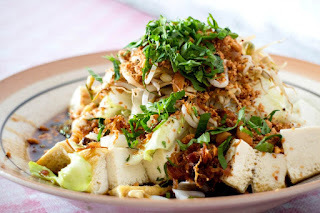 Doclang is a traditional food of Bogor made from lontong with spicy peanut spices. In Bogor itself this food is increasingly difficult to find. These foods are usually sold around from one area to another by the way borne. Doclang itself includes simple food. 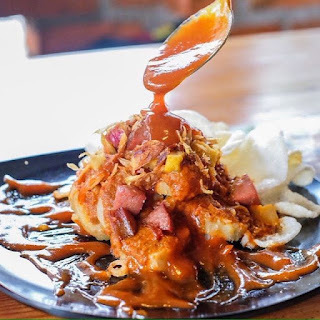 Food that is generally eaten at breakfast consists of large sliced lontong slices wrapped in leaves patat, potatoes, tofu, crackers, and boiled eggs. Various ingredients are then sprinkled with peanut sauce mixed with various kinds of spices. Then, these ingredients plus soy sauce, and sauce for those who like spicy. At this time generally sellers Doclang can be found from morning until noon in residential areas or residents village. But there are also some sellers Doclang menjajakannya with carts available from morning even until afternoon or evening in the area of Jembatan Merah Bogor. 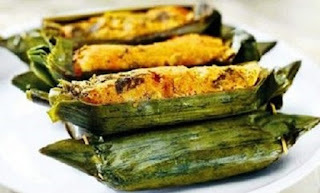 Pepes or Pais is a typical way from West Java to process foodstuffs (usually for fish) with the help of banana leaves to wrap the fish along with the marinade. How to make it is spices and spices mashed and added basil leaves, tomatoes, and chilli pepper / dibalut with carp already cleaned. All then wrapped with banana leaves and embedded with 2 small bamboo pieces at each end. This package is then burned (dipepes) on fire or embers from charcoal until it dries. Kupat Tahu is a traditional Indonesian food made from ketupat, tofu that has been fried, and also peanut seasoning. Lontong can also be used instead of ketupat. There are many types of kupat tahu, but the famous ones are originating from Singaparna, Surakarta and Magelang, the difference lies in the spice and complementary, if the Magelang and Solo version there are slices of cabbage and bakwan and mi and white tofu like Magelang version in Solo version, but in Singaparna version there are bean sprouts that have been boiled. In addition to these two variations, there is also kupat tahu petis, the difference is in the marinade that uses Petis and added fresh cucumber slices. Kupat knows can also be added with crackers and chilli as an appetite enhancer. One of the most famous I know that I know Kupat Gempol in the area of Pasar Gempol, Bandung.